Grayson Perry, the Turner-prize-winning-cross-dressing ceramic artist, is fast becoming a national treasure. So when you get the chance to go and see him speak in the flesh, at the inauguration of the Centre for Humanities Interdisciplinary Research Projects (CHIRP) and the Centre for Editing Lives and Letters (CELL), there’s nothing to do but go along and be dazzled. And dazzle he did. 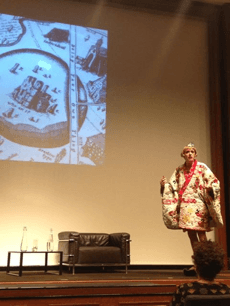 Fresh from his wildly successful Reith lectures and dressed up to the nines in a glittering kimono, Grayson Perry lived up to his reputation as one of the most alluring personalities in British art today. Fittingly, his lecture was about something I think the new UCL President & Provost Professor Michael Arthur approved of – how to inspire students. Specifically, the response to a question that a student asked him last year – how does he decide what to make his art about? We are swimming in an ocean of information, all with the potential to inspire. But, as the student who inspired this lecture had no doubt already realised, brandishing an iPhone is not enough. Grayson describes himself as “walking around in a vast plain of culture”. In order to stand a chance of whittling this down we have to know who we are and what we want. He commands artists to take the terrifying road of ‘doing your own thing’. Intelligence has now been reduced to Google. Passion and curiosity and the power they have to motivate are key to being creative. Of course, motivation differs from person to person. He jokes that another artist, in India for example, might be motivated by the struggle to survive, whereas a student in the UK might be more motivated by looking good on Facebook. This point is about not dismissing ‘silly ideas’. Grayson describes ideas as furry creatures – you have to be nice to the first one that comes out of the forest otherwise the others might not follow. He’s also gotten a lot from playing drawing games with his daughter. He drew castles and characters with her, and one of those castles is now actually being built in Essex by a firm of architects (although that last example might say more about what it’s like to be Grayson Perry than creativity itself). In the early 1980s when Grayson was starting out as an artist, ceramics were just about the most uncool thing possible to do as they were heavily associated with the granny-ish craft shop. A bit later the ‘Cool Britannia’ of the 90s came about, which again Grayson hated. As WH Auden said: “A poet’s hope to be, like some valley cheese, local but prized elsewhere. Grayson gave the example of his hatred for the Westfield shopping centre – “the death star of Shepherd’s Bush”. In response to its opening he made a pot with a map of the shopping centre on it, smashed it up, and then restored it. More familiar focuses for his anger have been his gallery (read: employer) and his mum. Just don’t, it’s not going to happen. Imagine you’re at Helsinki bus station. There are ten platforms, with 12 or so bus routes departing from each. At the beginning of your career you have to decide what bus to take. At the end of your bus ride (or about three years of work) you show people what you’ve been doing. They like it, but tell you it reminds them of another artist or thinker. Your reaction is to despair and go back to Helsinki bus station and start all over again. Grayson’s advice is – stay on the bus. For God’s sake stay on the bus! Artists copy each other all the time, and sometimes it just happens by chance. If you know what you want, and who you are then it’s fine. Ultimately, this is Grayson’s guide not just for being creative, but for how we can make better choices. 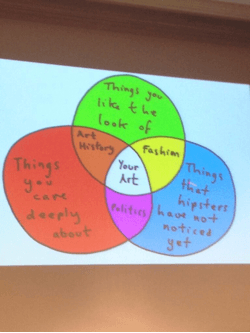 I came away from the lecture firstly, with a bit of a crush on Grayson Perry, but also with a burning desire to go and do something new. The feeling may not have lasted, but if I glance at this Venn diagram every once in a while I think I’ll be a step closer to being productively uncool, staying on the bus and, hopefully, making something of it.